Oom-pa... Loom-pa... Do-ba-dee-do, we've got an-o-ther Blu-ray for you! In an early announcement to retailers, Warner Brothers is preparing 'Charlie and the Chocolate Factory' for Blu-ray on October 4. This remake starring Johnny Depp and directed by Tim Burton was released on HD DVD back in the fall of 2006. 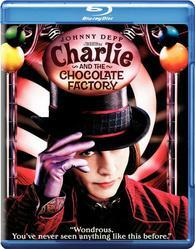 The Blu-ray will feature 1080p video, a Dolby TrueHD 5.1 soundtrack, and supplements will include: In-Movie Experience viewing option with Tim Burton; Commentary with Burton; 2 previsualizations - Augustus Gloop dance and Mike Teavee dance; Dolby TrueHD music-only track; European club reel; Theatrical trailer; Charlie and the Chocolate Factory: Chocolate Dreams; Different Faces, Different Flavors; Designer Chocolate; Under the Wrapper; Charlie and the Chocolate Factory: Sweet Sounds; Becoming Oompa-Loompa; Attack of the Squirrels; and Fantastic Mr. Dahl. Suggested list price for the Blu-ray is likely $19.98. You can find the latest specs for 'Charlie and the Chocolate Factory' linked from our Blu-ray Release Schedule, where it's indexed under October 4.